Wake up your makeup and workout your lashes with Triple Shot Mascara. The unique starfish-shaped brush design features a fraction of the rows of bristles found on a conventional mascara wand. This allows for excess formula to remain in between the rows and transfer onto the root of the lashes on contact. The firm, comb-like bristles coat a generous amount of product onto every hair, creating effortlessly thick, curled, and glossy lashes without clumping. This mascara doesn't flake or fall out, it stays put so when it's time to remove, simply use a gauze pad with makeup remover and in a few short swipes it'll be all gone! 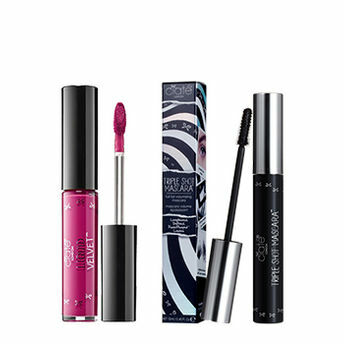 Liquid Velvet Matte Lip Slick combines highly pigmented, gorgeous matte longwearing lip colour with Hyaluronic Acid for its intense lip-conditioning benefits to help make lips look fuller, while feeling more supple and smooth. The creamy, non-drying formulation is infused with Ciate's proprietary blend of moisturizing PlushPigment, and features high-performance pigments that glide on to lips for bold, kissable colour with extreme hold. The Innovative precision tip effortlessly lines and then fills in lips for perfect application.